Sole Pads - Buy One Get One Free! Home > Health Care > Legs & Feet > Foot Care > Sole Pads - Buy One Get One Free! Sorry, 'Sole Pads - Buy One Get One Free!' has been discontinued and is no longer available. Please check our related products, categories, or store search. Buy 1 Get 1 Free Sale! - While Supplies Last! 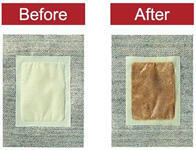 The pads are made from organic cotton and are used for absorbing small amounts of body fluids from the body's surface. The Sole Pads are a wellness breakthrough that are specifically designed to awaken your body, mind and spirit to a healthier, happier and more energized you. The Sole Pads are conventionally used to help disperse feelings of anxieties and nervous restlessness. The creation of the Sole Pads came about after a 25 year Japanese study on the mystical powers and energy of mature trees found deep in forests. The growth process of trees is a boundless source of knowledge and unexplained powers. Even under the worst weather conditions, trees can still grow and flourish for thousands of years on their own. Unlocking the secrets and applying them to humans, we find one of the keys to a better existence. Today, in the United States and many other countries, this is a unique way to experience natural relief from every day stress and much more. After a quarter of a century of research and development, it was discovered that wood vinegar has an unparalleled ability to uplift the mind, body and soul. Using advanced technology, Sole Pads are made from a unique recipe of wood vinegar, tourmaline, Siberian ginseng, and several other ingredients that are combined into organic cotton packets. No starch, fillers, shellfish, sulfur or mushrooms are used.  TOURMALINE is not only prized as a beautiful, semiprecious gem, Tourmaline is the only mineral to show permanent electricity on the earth. When the positive and the negative electrodes of a tourmaline crystal are connected to each other or put under pressure or warmed, it generates a voltage (0.6V) and a low electricity of 0.06mA, equivalent to the body's. This electricity has deep penetration and can reach well into subcutaneous layers of the body where energy is produced and a deep penetrating heat.  BAMBOO VINEGAR is a byproduct of the production of bamboo charcoal, which is produced by burning bamboo in order to carbonize it. The process takes almost a year to perform. Scientific research indicates that it contains over 800 organic compounds, including glacial acid and at least ten different phenol groups. Bamboo vinegar, which is 47% acetic acid, has a pH similar to that of household vinegar, which is why it was given the name "bamboo vinegar". It is a balanced recipe rich in minerals and trace elements such as Potassium, Calcium, Magnesium, Zinc, and Iron. These minerals and elements make it 30 times better than other vinegar's. It has polyphenols, too.  SIBERIAN GINSENG The active ingredients in Siberian ginseng are eleutherosides. Nutrients such as vitamin C, Beta-carotene, vitamin E, niacin and vitamins B1, B2, B6 and B12 are found in SIBERIAN GINSENG. It also is a source of minerals which include calcium, potassium, phosphorus, sodium, magnesium, barium, iron, strontium, boron, copper, manganese, chromium, cobalt, germanium and zinc. Alternating feet each night, apply an Sole pad on the sole of one foot and on the part of the body that is affected just before sleeping. Dispose of the soiled pad the next morning. Use a fresh pad every night until the pad is lighter in color and dryer. Then use twice a week as a maintenance program. 20% Tourmaline for removal of natural far infrared rays and negative ions, Bamboo Vinegar, Achyranthis Root, Red Peony Root, Eleutherococcus Senticosus, Artemisia Iwayomogi, Caragana Sinica, Platycodon Grandiflorum. Keep away from infants. SOLE Pad is not food and should not be eaten. Use this product for external use only. If you have sensitive skin, you may find you cannot keep the pad on for 8 to 10 hours. Do not place near eyes or open wounds. Do not use if the pad is damaged. Do not use if pregnant or breast feeding.